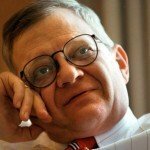 Tom Clancy was one of the best selling spy authors of all time, known not only for his technical accuracy – gleaned through extensive government contacts – but also for an uncanny ability to predict the future. Part of his FBI file was released in 2014 but in recent weeks another section has been made available. It sheds light on just how deep his government contacts must have run, on both sides of the Atlantic. The first part of Clancy’s FBI file is mostly a bunch of background checks because he was being considered for a position on the White House Space Council. It also shows that then FBI director William S Sessions attended the premiere of Hunt for Red October. The new documents, posted by The Black Vault, are from just after he was awarded the position on the Space Council, and are the FBI’s copy of Clancy’s SF86 – Standard Form 86, a questionnaire that you have to fill in to work in any National Security position in the US government. In the section about membership of organisations Clancy listed the US Naval Institute (a supposed NGO based at the US Naval Academy in Annapolis) which he had joined in 1980 as a lifetime member. The Naval Institute were the original publishers of The Hunt for Red October in 1984. 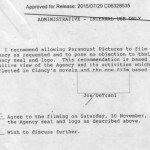 Clancy also listed the Air Force Association and the Writers Guild. He expanded in the section for additional details adding that he was a member of several other organisations, including the National Rifle Association until 1975. The odd thing is that Clancy joined the two military organisations in 1980 but didn’t join any other organisations until 1988-89 when he joined the Writers Guild, the Science Fiction Writers of America, the Mystery Writers of America, became the national chairman of the Patriots of Fort McHenry and joined the board of the National Defense University. And then was nominated for and granted a position on the White House Space Council. 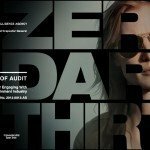 Though he had long had contact with government agencies, it appears that this period in the late 1980s saw his stock rise considerably, and solidified that bond. However, it is the section on his contacts with members of Soviet, Soviet bloc and Communist countries that is perhaps most revealing. 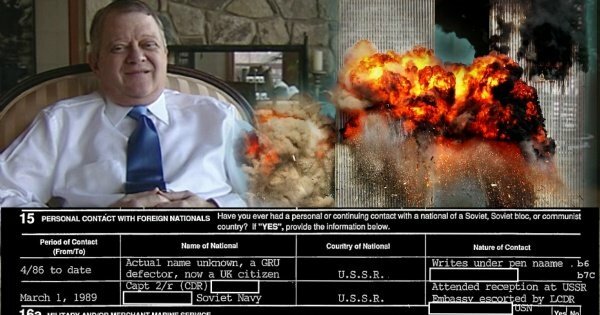 Clancy recorded how he had personal contact with a GRU defector since 1986. The man, whose real name Clancy says he didn’t know, was a UK citizen who wrote under a pen name. My best guess is that this was Victor Suvorov, the pen name of Vladimir Bogdanovich Rezun, a GRU captain who defected to the UK in 1978. Clancy also mentions he had contact with a captain (2nd rank) in the Soviet Navy, at a reception at the Soviet Embassy which Clancy was escorted to by a Lieutenant Commander of the US Navy. In the additional details Clancy notes that since 1986 he had been personally acquainted with a KGB Major who defected and was now living in the US. Clancy also mentions that the defector wrote an autobiography of some kind, so this man must be Slanislav Levchenko, the author of On the Wrong Side: My Life in the KGB. However, I have been unable to identify the third Soviet defector that Clancy was friends with, a woman who, like Levchenko, wrote a book about her life and was granted US citizenship in 1989. Clancy was clearly good friends with her – he attended the celebration of [redacted] granting her US citizenship. The obvious question is how did Clancy get to know this trio of Soviet defectors? It may be significant that after the publication of The Hunt for Red October the CIA started inviting Clancy to Langley, formalising their relationship with him. Was Clancy introduced to Levchenko by the CIA? It is certainly possible. As to the female defector – note that in the document the name of the agency or institution that granted her citizenship is redacted. The redaction is too short to be a reference to the White House or the State Department and if it was just the normal process done through the INS then why redact the name of the agency? All of this suggests that Clancy attended the celebration of the CIA granting this female defector US citizenship. Finally, it’s anyone’s guess how Clancy made contact with a British Soviet defector, whose real name he didn’t know, unless he had help from British intelligence. One of the features of Clancy’s books, and indeed of the whole spy fiction genre, is the ability to predict or foresee or foreshadow future events. Usually this is in quite general terms, like the Clancy computer game Ghost Recon – released in 2001 – which depicted (and predicted) a war between Russia and Georgia in 2008. However, two of Clancy’s books managed to foresee some of the most important and world-shaping events in the War on Terror. 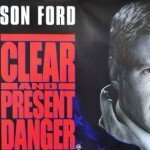 In his last novel before he died – Dead or Alive – he depicts a terrorist mastermind known as ‘the Emir’ who is hiding out in a secluded compound near a major military installation, communicating only by courier. He is tracked down and assassinated by Navy SEALS. The book, Clancy’s first for several years, was published 6 months before the Abbottabad raid. Similarly, in 1994 Clancy published Debt of Honor, which tells the story of a hijacked plane being crashed into the Capitol building by a suicidal pilot seeking revenge against the US. This was so uncanny that even the BBC picked up on the possible relevance, including Clancy in a 2002 episode of Panorama called September 11: A warning from Hollywood. How did Clancy come up with the suicide hijacking idea? In the clip above Clancy is asked twice how he came up with the idea and is evasive both times. The first answer he gives is a story about him suggesting the idea to an Air Force officer and getting a surprised reaction. The second is a generic answer about thinking of vulnerabilities and saying that using a plane to suicide-crash into the Capitol is ‘obvious’. Not that Clancy was the only person to predict this scenario, but in reality it wasn’t as obvious as Clancy makes out in this interview. Clancy’s name is spelt wrongly, which means this document would not come up in cross-reference search of FBI files relating to Clancy, though I doubt this is deliberate. What we can be sure of is that the only author that Bishop was known to have been into was Clancy, and the only author who wrote a book predicting not just 9/11 but also what Bishop would go on to do was Clancy. 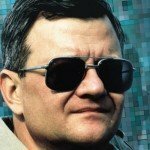 Was Tom Clancy a Terrorist? 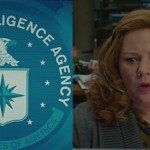 Whatever the facts of Bishop’s subconscious we are presented with an interesting possibility: just as hackers are a way of testing the cybersecurity of institutions and thus live in a curious symbiosis with the institutions they hack, so do terrorists, and so do the creators of terrorist fiction. Without people conceiving of and sometimes carrying out imaginative attacks on the security system the system cannot know if it working, it cannot learn to adapt and improve. To win an arms race you need an opponent to race against. This is true conceptually (culture creators), virtually (hackers) and materially (terrorists). Clancy, whether he realised it or not, may have been a vital pawn in that particular game. 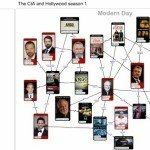 You can download the second part of Tom Clancy’s FBI file here, and the 302 recording the interview of Charles J Bishop’s teacher here (both PDF). 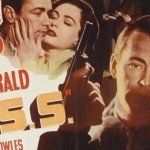 ClandesTime episode 039 – O.S.S.